The two-dimensional nonlinear evolution of the interface between two superposed layers of viscous fluid moving in a channel in the presence of an insoluble surfactant is examined. A pair of coupled weakly nonlinear equations is derived describing the interfacial and surfactantdynamics when one of the two fluid layers is very thin in comparison to the other. In contrast to previous work, the dynamics in the thin film are coupled to the dynamics in the thicker layer through a nonlocal integral term. For asymptotically small Reynolds number, the flow in the thicker layer is governed by the Stokes equations. 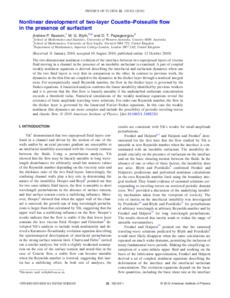 A linearized analysis confirms the linear instability identified by previous workers and it is proven that the film flow is linearly unstable if the undisturbed surfactant concentration exceeds a threshold value. Numerical simulations of the weakly nonlinear equations reveal the existence of finite amplitude traveling-wave solutions. For order one Reynolds number, the flow in the thicker layer is governed by the linearized Navier–Stokes equations. In this case the weakly nonlinear film dynamics are more complex and include the possibility of periodic traveling-waves and chaotic flow.